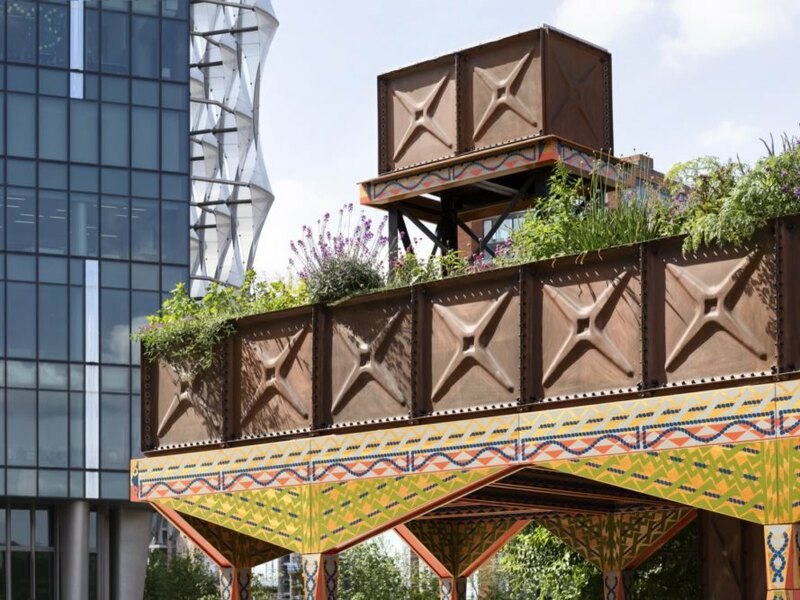 Cities across the world are reclaiming their waterfronts – and that includes London, where a series of verdant gardens are sprouting to reconnect the populace with the Thames River. 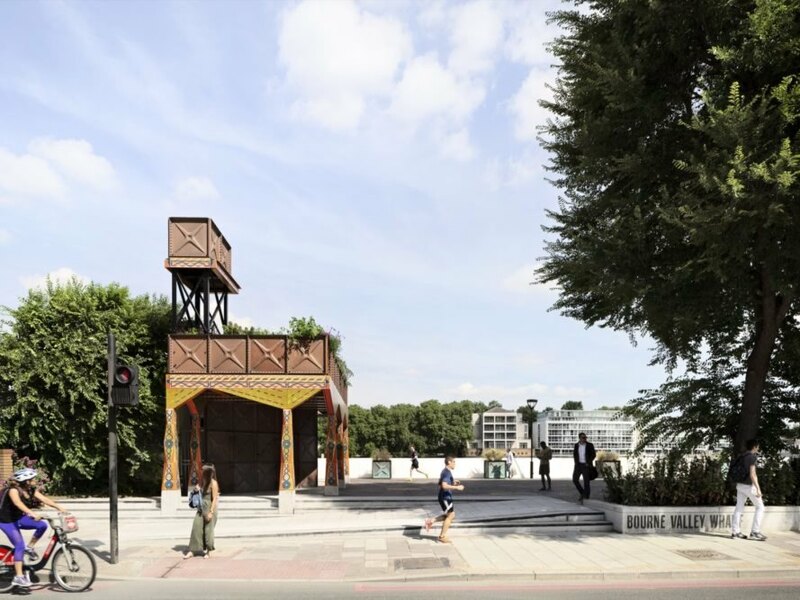 As part of the Nine Elms Riverside Strategy to revitalize the waterfront in South West London, local architecture practice Studio Weave was tapped to design a landscaped pavilion that draws inspiration from the bygone industrial era. 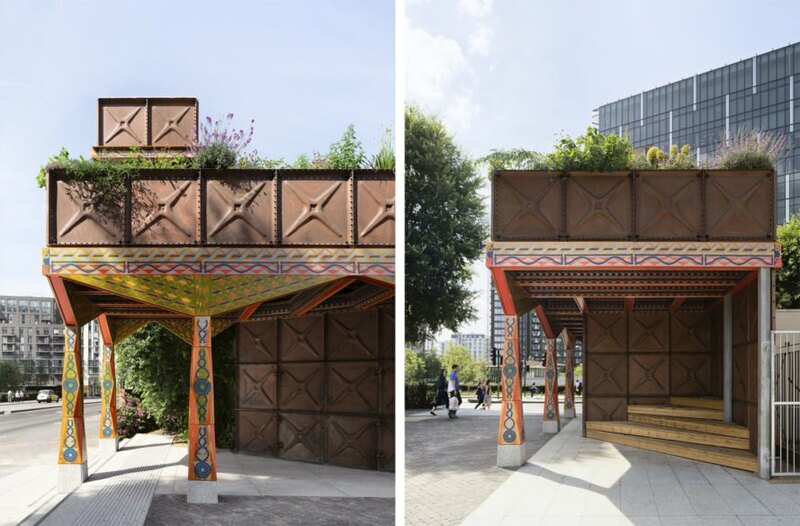 Raised on timber-clad steel columns, the pavilion—called the ‘Nine Elms Thames Walk Pavilion’—combines copper-coated water tank panels with a lush and elevated garden that provides habitat for wildlife and shelter for passersby. 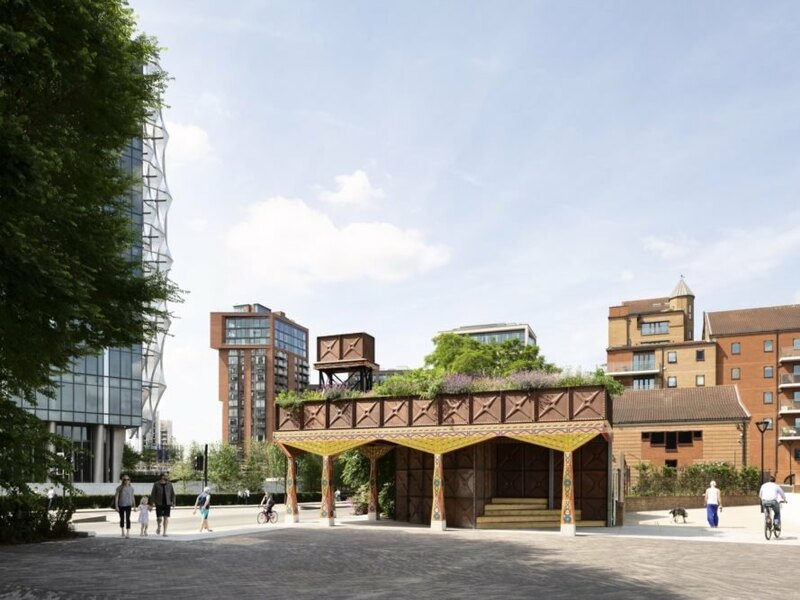 Completed this month in collaboration with Churchman Landscape Architects, the Nine Elms Thames Walk Pavilion is part of a larger scheme to beautify the Thames Riverside Walk. 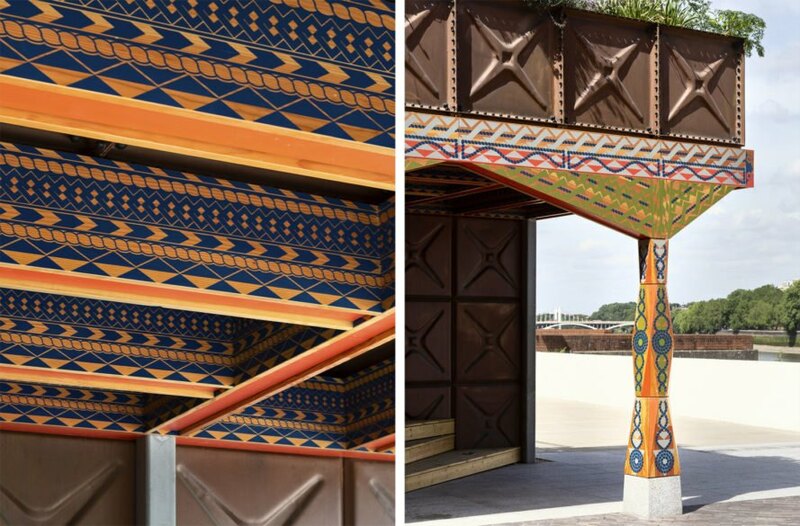 The ground-level planters and the raised pavilion are both constructed with the same proprietary metal panels—typically used for water tanks—that have been sprayed with a copper finish in reference to the area’s industrial legacy. Over time, these panels will develop a natural green patina as they weather the elements. 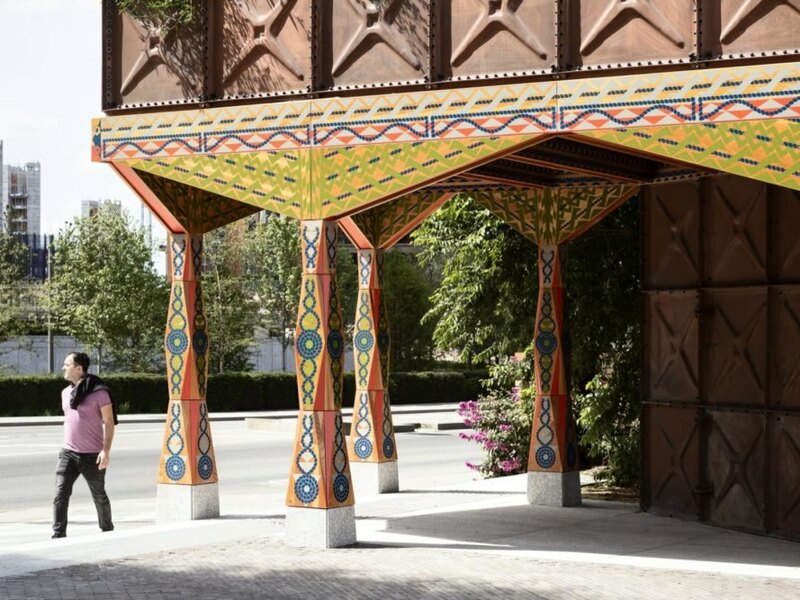 To bring an extra splash of color to the structure, print artist Linda Florence was invited to design the colorful pattern on the screen-printed timber columns. The rope-work and abstract motifs also add interest to the installation. The Thames Walk Pavilion also provides furniture and equipment for use at Bourne Valley Wharf. The pavilion was completed in collaboration with Churchman Landscape Architects. The elevated garden is planted with seasonal flora. The pavilion provides shelter to passersby. Artist Linda Florence designed the patterns on the columns and undercarriage. Metal panels were sprayed with a copper finish. The pavilion was developed to revitalize the waterfront. The pavilion metal panels match the ground-level garden planter construction. The garden provides habitat to local fauna.